It is said that Lord Nelson and Lady Hamilton stayed here in 1802 while visiting Oxford, and the hotel’s Trafalgar Room is believed to be that in which they spent their time. Other notable visitors include King Charles II (Nell Gwynne is purported to have conveniently lived in the town) and the acclaimed artist, William Morris who stayed in September 1876. 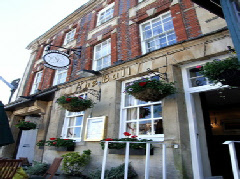 The Bull features just 12 guest rooms in all, a number of which contain four poster beds. Its 2 AA Rosette restaurant specializes in creative British cuisine, while the bar serves lighter meals and snacks. Burford itself is the epitome of a small Cotswold town, and much of the area’s most notable other villages and towns such as Bibury, Bourton-on-the-Water and Stow-on-the-Wold are within easy reach by car.